Amazon Fire TV has always been one of my favorite gadgets. The Amazon Echo, as I’ve previously explained, gives me pause. So when I heard that Amazon was combining Fire TV with Alexa capabilities to create a whole new device called the Amazon Fire TV Cube, my first thought seemed peculiar: Uh oh, people are gonna love this. The $120 Amazon Fire TV Cube makes up for its wordy name by doing a lot. Its primary feature involves controlling your TV and the Amazon Fire TV software with your voice. Amazon has programmed a whole host of new capabilities that not only let you turn on your TV and turn up the volume but also navigate between channels and find content on channels like Netflix and Hulu through Amazon Fire TV. 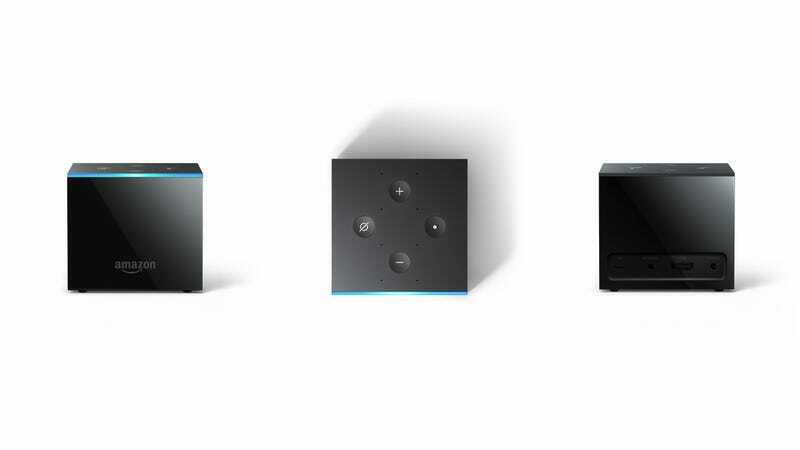 The Cube itself is equipped with a linear array of eight microphones similar to the circular array on the Echo, so that Alexa can hear your commands even when the TV is playing. So you can say, “Alexa, show me scifi movies,” and a numbered grid scifi movies will appear on the screen. You can make your selection either by saying the number of by saying the name of the movie. Importantly, you can also use your TV or a Fire TV remote to control the TV by pointing them at the device. The commands also work with live TV services as well as regular old cable boxes. Secondary to turning your voice into a remote control, the Fire TV Cube also works the illegitimate lovechild of a $30 Echo Dot and a $150 Echo Show. It’s an Alexa-powered speaker (emphasis on the Alexa, not the speaker) that will answer your questions and obey your commands. Do you have the Alexa skill setup for your Philips Hue lights? Then the Fire TV Cube is capable of hearing your command and turning on the lights. Big whoop. An Echo Dot does that just fine. But if you ask the Fire TV Cube about the weather, it can show you the forecast on the TV. There are various other Echo Show-like skills that people might enjoy seeing on their home’s biggest screen. So I’m thinking, on one hand, Amazon is making it super cheap and easy to get rid of my clanky bundle of TV remotes. Other companies, most recently Sonos, are offering the same thing in the form of smart sound bars, most of which use Alexa technology. But the Sonos sound bar costs more than twice what the Cube costs and offers flexibility when combining your existing components. On the other hand, Amazon is asking you to put another always-on Alexa device in your home. That’s totally cool if you’re part of the very large Echo-loving community! It might also make some people nervous to talk to Alexa every time they wanted to change the channel. After all, the Cube represents an uniquely new way to talk to Alexa and integrate her powers into your daily life. The artificially intelligent assistant gets better all the time, but it does make some weird mistakes sometimes. It was only a couple weeks ago that we learned about an Echo that sent a private conversation to a couple’s colleague not because of a hacker but because of a series of coincidences as well as some shortcomings in Alexa’s ability to understand human voices. It’s a well known reality that gaining convenience can often mean losing some privacy or security. Everyone has to figure out their own version of that equation. Until I can get my hands on it for testing, I can’t say how convenient the Cube may be. A demo of the device (conducted by Amazon) did lead to me saying “Oh that seems handy” more than once. Some glitches did rear their heads, but that’s not unusual to see in a gadget that’s yet to reach the market. The Amazon Fire Cube TV is available for preorder today for $120. Prime members can get a $30 discount if they preorder one today or tomorrow. The devices start shipping on June 21. It’s a curios proposition, when you think about it. Being able to control your existing home entertainment system with special set-top features could be pretty cool. Plus, the extra stuff. The Cube does everything that a Fire TV does, everything that an Echo Dot does, some of the stuff that the Echo Show does, and some stuff that nothing else does. Yes, you will need to be a part of the Echo data circus to get access to all of that. Maybe you love doing that.